I’ve completed nanowrimo – what’s next? That’s the question that many people are asking themselves at the moment, or will do over the next week or so. If you’ve been keeping up with the wordcount, churning out your story and ploughing on to the end, you should have 50k or more words of a first draft and might be considering the next step. Please don’t rush to publish your story as soon as possible. Your story deserves more than that. It deserves a careful re-reading, consideration and editing before it is cast out into the world. The industry gets flooded with nanowrimo stories at this time of year, as new writers, overcome by the excitement of having written a novel, send it out too soon. Readers can be easily put off by a badly presented story, and you risk damaging your reputation as a writer and the reputation of indie writers generally. For the same reason, please don’t rush it out to an editor or agent. An editor is likely to cost a lot of money if called in at this early stage, and an agent is likely to have many such manuscripts sent to them. On the other hand, if you just want to share your work with family and friends, why not find a company who will print a few copies for you? Set the manuscript aside for a month or so. Then you should be able to read it through with a more objective eye. You might be pleasantly surprised or you might be shocked. Either way, make notes as you read, and then go through and fix the issues you spotted. Take a look at your characterisation – do your characters grow and develop? Do they behave consistently? Are they interesting? Take a look at your show/tell balance – one thing that might help here is to use highlighters. Highlight dialogue in one colour, and telling passages in another. This will give you an overall view of your balance. Take a look at your use of settings. Do you know where the scenes are set? How do the characters and the plot interact with the setting? Take a look at the structure. Is there a clear progression in the story? Is it logical? Once you’ve considered all these, and revised your story as much as you can accordingly, then you need to seek out a beta reader or two. This should be someone who reads the sort of story you’ve written and is willing to comment honestly on it. If you don’t know anyone suitable, then try looking online, in places such as goodreads.com groups, or search for beta reading services. You might be asked for a small fee, or you might be lucky and find a good reader who will read for free, or will agree to exchange services. Don’t spend too much at this stage! Another useful resource is scribophile.com, where you critique work to earn points that you spend to post your own work for critiques from other writers. After you have heard back from the beta reader(s), it’s time to work through some more, with their comments in mind. You don’t have to implement everything they say, but they should raise some points that will help you develop the story. Once you’ve reached the point where you can do no more yourself, then it’s time to consider whether your work is ready for editing, proofreading and publishing, or whether it’s better to set your manuscript aside, start on the next and return to this one when your writing has improved still further. This entry was posted in writing and checking and tagged beta reading, editing, first draft, nanowrimo, writing on November 23, 2015 by Lin White. 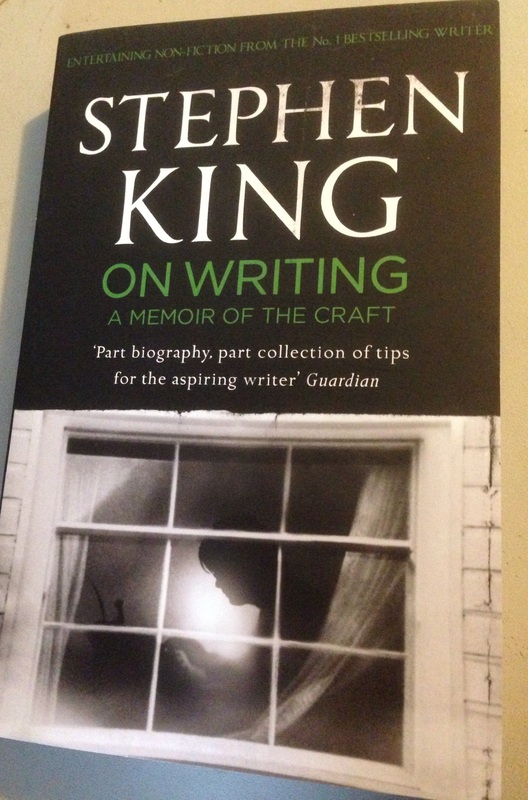 On Writing by Stephen King is probably one of the most famous books around on the topic of writing. I first read it years ago, and while working through books for this blog I decided it was about time I read it again. I was half-expecting to slog through the autobiography section, but found that King tells stories in such an entertaining fashion that I was laughing out loud. It’s not a complete story of his life, but some of the highlights and stories from his childhood and early experiences as a writer. The second section, The Toolbox, starts off with an anecdote about his uncle’s old toolbox, and develops into a description of what he sees as the writer’s toolbox: the essential tools that every writer should take with them everywhere, in order to be able to use whatever tool best does any given job. Here, the importance of issues such as grammar and vocabulary are discussed. 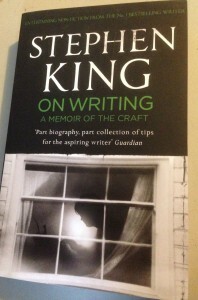 The third section, On Writing, contains more general advice on writing, including King’s own writing processes. You might or might not agree with all his points – he is actively against plotting, preferring to allow the story to develop from the situation and characters, for example – but you will find them enlightening and thought-provoking. The fourth section, On Living: A Postscript, describes his experiences on being hit by a van and badly injured. Again, King brings the story to life with a few vivid details, and the account is very readable. The final sections include an example of the first and second draft of an excerpt, with detailed explanations as to why he made the changes he did, and a detailed list of recommended books. King is a prolific reader – one thing he is clear on is that if you don’t have the time to read a lot, you’ll never be able to write successfully – and the list comprises fiction books he has read and recommends. If you take nothing else from this book, you will get an idea of the dedication and hard work it took King to get where he is today, and you’ll have a much better understanding of what life as a successful writer is like and how to get there. I completely understand why this is one of the books that is constantly recommended to writers and would-be writers. This entry was posted in Writing book reviews and tagged editing, reading, writing on November 4, 2015 by Lin White.